Presentation scenarios allows students to hone their delivery skills by practicing giving presentations as often as they like. The conversation thread allows student responses to be mentored by any number of peers and managers. 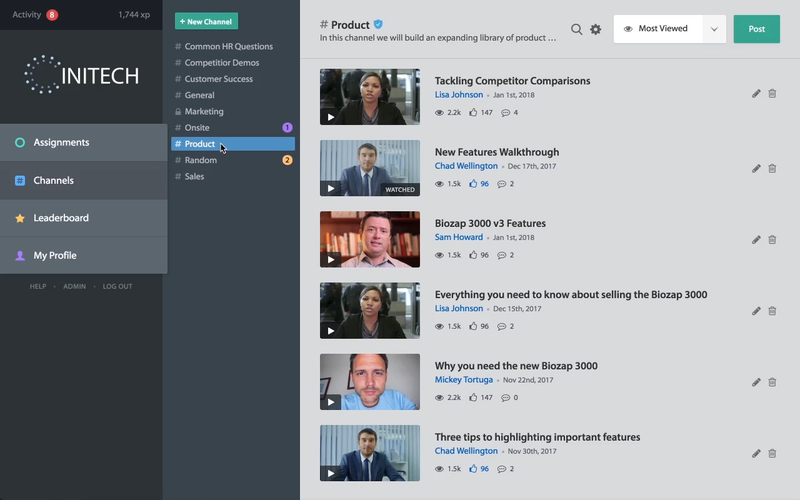 Channels provides a flexible space for conversations and collaboration. Share top responses and build a library of best practices to inspire the whole team. 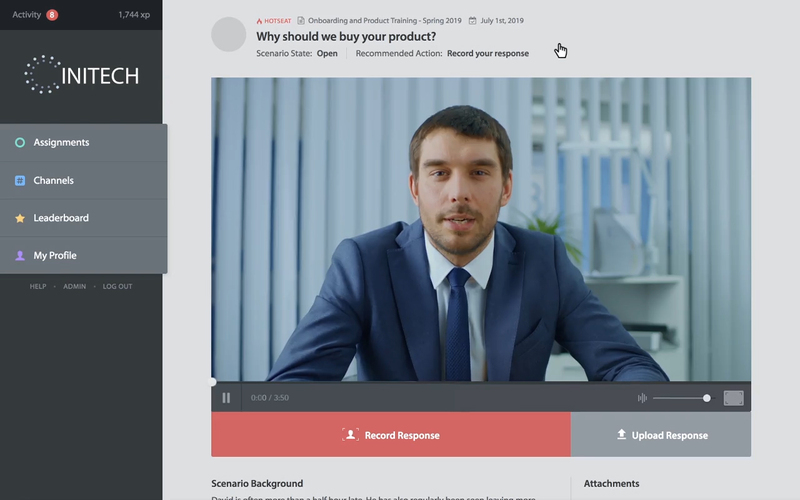 Easy screen recording works with any desktop browser and opens up new training applications like practicing software demos or sales presentations. 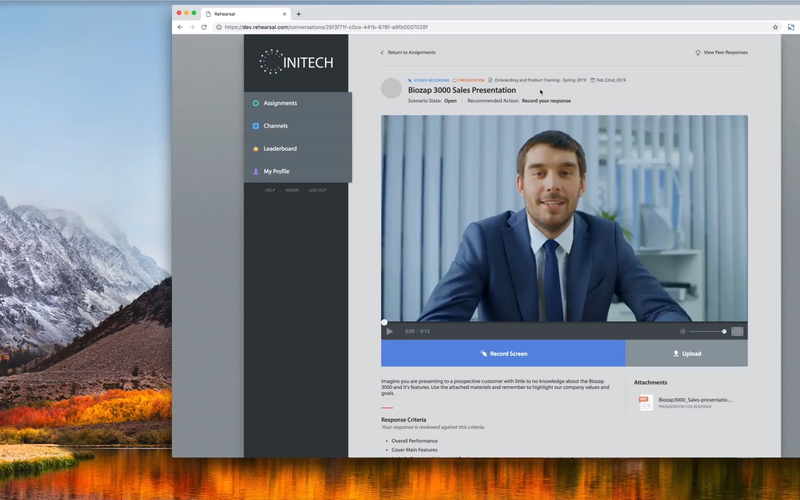 Easy screen recording works with any desktop browser and opens up new training applications like practicing software demos or PowerPoint presentations. 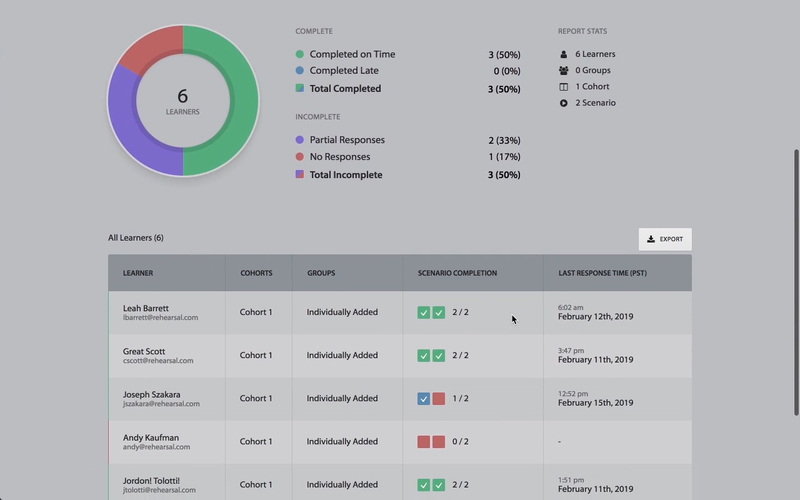 Rehearsal's in-depth reporting section allows you to easily monitor your team's progress and activity. Rehearsal works on tablets, laptops, PCs, and smartphones – all you need is a web browser and an Internet connection. Learners can perfect their selling skills in a safe and private environment. Easy screen recording works on any desktop browser and opens up new training applications like practicing software demos or PowerPoint presentations. Ongoing video interactions between learners and mentors creates an organic learning environment. Rehearsal is currently available in twelve languages, with more to come. Rehearsal is by design very easy for your team to use. Log in, select a scenario, respond. Done. Put your learners to the ultimate training test with hotseat scenarios where they get one chance to respond. Easily find who is, and is not, responding and mentoring. See entire activity logs for each learner, and more. Allow teams who provide customer service over the phone to practice their responses with audio-only scenarios. Rehearsal integrates with just about every LMS out there. 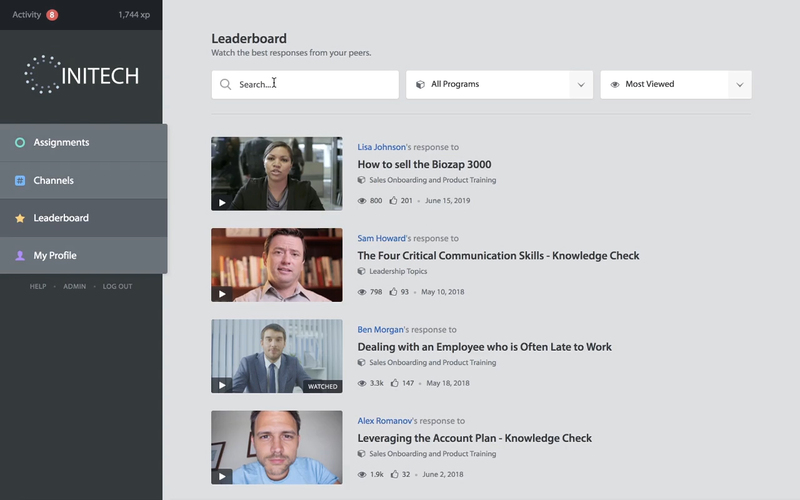 Any learner response can be made visible to all learners by submitting it to the leaderboard. Nobody likes remembering a bunch of usernames and passwords. With SSO, your team can access Rehearsal with ease. All content is securely hosted and backed up in the cloud. Specifically, we use Amazon AWS - the same service Netflix uses. Our fanatical Customer Success team is engaged in your success from day one and beyond! Rehearsal's polite and savvy support team is easily reachable to help resolve issues quickly. The best practice and training solution for your team.